Question No. 1: Will the OL be able to keep Raynard upright this season? 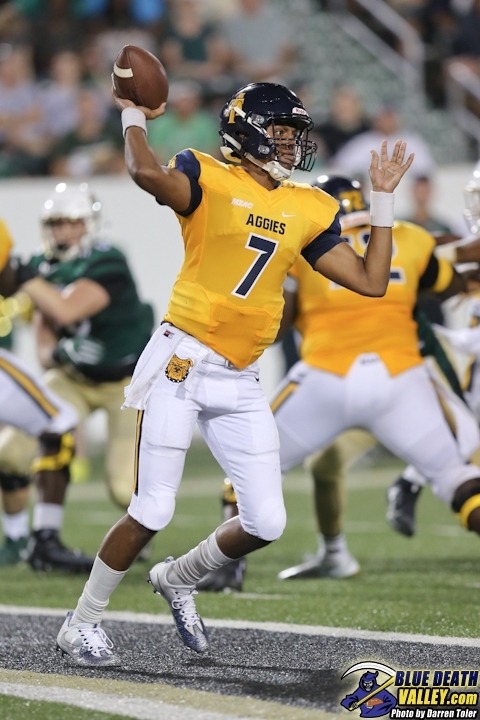 Lamar Raynard has never lost a game as A&T’s starting quarterback. He is the defending MEAC Offensive Player of the Year and already owns a bunch of school passing records. However, he will be not be a very effective weapon for us if he is constantly on his back and removing divots from his facemask. We have to replace 4 starters on the offensive line from last year and my biggest concern are the left and right tackles. Losing Parker is huge (no pun intended) and frankly the drop-off appears to be pretty steep based on what I saw in the scrimmage last week. Granted our entire pass protection was brutal in that scrimmage but I specifically remember how easy we were getting beat off the edge. Got to shore this up if we hope to have a potent aerial attack in ‘18. Also keep an eye on the shotgun snaps. That was pretty erratic the other day as well. I think it will take time for the offensive line to jell but our coaches know what it will take for us to win. They built last season's offensive line and I'm confident they know how to build another one just as good. Now if you want to worry about something, worry about out kicking game. For me, last year our kicking just wasn't good. Our kickoffs were often short and gave our opponents good field position and our field goal kicking was a crap shoot. If you want to see just how shakey our kicking game was, watch last year's Celebration Bowl. Ugh! That was actually further down on my list. Question No. 6: Will our kicking game end up costing us some wins this season? Even though A&T ranked third in the MEAC in FG kicking (9-of-11), I dont think anyone here needs to be reminded of Noel Ruiz's performance in the 2018 Celebration Bowl. One time when the camera panned over to him I swear it looked like he was ready to rip his jersey off and call an uber to come pick him up from the stadium. Never seen a player lose their confidence that dramatically on that big of a stage. Hopefully he can rebound from that and has put in the work this winter to get back on track. It's a mental thing with kickers, though, and you never know what is going on between their ears. Personally, if he can just make the XPs and chip shops from 30 yards in, I will be happy. On another note, our kickoff coverage unit needs to improve from last season also. I believe we ranked next to last in the conference and a big part of that is probably due to the short kickoffs, as marchingband1969 pointed out. I would just hate to have another repeat of the Coastal Carolina game where we fight with a tough opponent tooth and nail the entire game, only to have a special teams miscue late in the contest cost us the victory. The offensive line last year was primarily a veteran group. We have another kicker who is no longer a redshirt who I believe could definitely help out with the kicking game if he is giving the opportunity. Are you talking about that Rogers kid? If so, what is his range on FGs? We need somebody who can consistently make a 40 yarder. In the Celebration Bowl, Ruiz was not making anything further than an extra point. Yes, I'm pretty sure he has the leg strength but both kickers will be working with new holders as well. So it will be interesting to see how they perform in the Spring game. I believe the snapper is the same from last year. Question No. 2: Who's gonna fill the playmaking void at linebacker? Marcus Albert and first team ALL MEAC selection Jeremy Taylor are now gone. And leaving with them are a combined 105 tackles, 17.5 tackles for loss and 5 interceptions (Although Taylor had all five). The speed and aggressiveness in which both of those guys flied around the field last season caused plenty of havoc for opposing offenses. We will need someone to step up quikcly and become a bigtime difference maker if Blue Death is gonna be the same defense. Deon Jones definitely has the talent but i believe he suffered a foot injury early this spring and probably wont even play Sunday. Kiaundric Richardson looks poised to have a breakout season and incoming freshman Joseph Stuckey might see some immediate action if he's half as good as advertised. It will be interesting to see how the unit will develop over the offseason. Question No. 3: Will a true home run threat emerge at RB? Dont get me wrong: I love Marquell Cartwright to death. Especially after watching his highlights from the UNCC game and the Celebration Bowl. He is a tough, dependable running back who holds on to the football and is money near the goal line. The only problem is that we were all spoiled for 4 years by a guy named Tarik Cohen. That ability to take a handoff on your own 25 yard line and find yourself in the endzone a couple of seconds later is what ushered in the golden era of this program. Think about how many close games we won over the years just because Tarik was able to break through the line of scrimmage one time and get into the open field. Cartwright can be shifty in short yardage but he doesn't possess that extra gear at the second level that Tarik does. Hell not many people in the NFL currently do. Last year Jamari Smith was a decent change of pace back, but right now I am not sure we have that type of explosive rusher on our roster. Darius Graves and the trasnfer from Coastal appear to come from the same Cartwright school of ground and pound. Maybe one of these guys will prove me wrong or maybe one of the redshirt freshmen will emerge as a secret weapon, but it would be nice to have a RB again who puts the fear of God in opposing defenses from anywhere on the field. Question No. 4: What kind of numbers will this receiving corps put up this year? If the answer to my first question is yes and Raynard is indeed able find some time in the pocket, we could be poised to witness some unprecedented stats from our pass catchers. On paper this might be the most talented group of wide receivers in school history. Everybody is fast, runs decent routes and attacks the football in the air. Elijah Bell will be playing on Sundays when he leaves A&T. Malik Wilson was tied for second on the team with 4 touchdowns last year. Ron Hunt, Zachary Leslie and Ahmed Bah are all stand over 6 feet and are huge mismatches in the red zone. I think Leroy Hill will be a seamless replacement for Trey Scott and, with the new guys in this summer, it will be a virtual Hunger Games to see who starts in the slot. So far, Isaiah Hicklin and Amos Williams have both looked pretty explosive. Once again, this is all contingent on Raynard being upright, but if he has the time to throw, our offense might be putting up pinball numbers. Question No. 5: What kind of numbers will our defensive line put up this year? As talented as our WRs are, this defensive line unit might be even more impressive. Pretty much everybody returns in 2018 including first team ALL MEAC defensive end Darryl Johnson, who led the team with 6.5 sacks and 15.5 tackles for loss last year. You also got a murder's row in Justin Cates, Julian McKnight, Sam Blue and Turner Echols. Redshirt freshman Artavious Richardson stood out to me in the scrimmage a few weeks ago. Crazy speed, length and athleticism all across the board. We literally are about 3 deep at all four positions on the D-line. Is it crazy to think they maybe this unit can combine for 60 total sacks in 2018? Any news on Kiaundric Richardson? He even has someone else wearing his number. 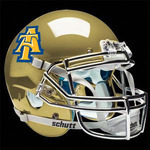 @ncat_football has images and videos of the spring game on their Instagram page. The O-Line and kickers are wearing our "old-school" white Russell Athletic jerseys. The QB's are in their "hands-off" red jerseys. Everyone else is either in Blue or Gold Nike jerseys with blue pants. Download the app to your iPhone or Android device, create an account, and follow the team.